Volume 8 concludes "The Shifting Sands" and takes our heroes about halfway through "Dread Mountain." As with the anime, the manga depiction of the Guardian of the Shifting Sands is no where near as terrifying as it is in the book. 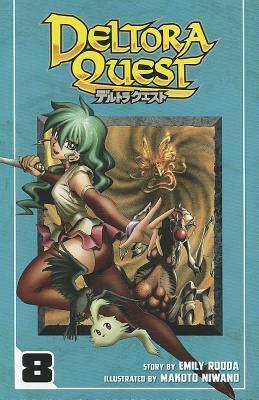 Lief's trials with the sands is emotionally and spiritually draining in the novel, while the anime and manga are more focused on external action. The point of the Guardian in the book was that it was mindless. It was a true Hive, an implacable enemy closer to a force of nature than anything sentient. The manga does give an interesting interpretation of the Hive, making it a collection of lost spirits that Lief cleanses with the power of the Lapis Lazuli (which is neat because the stone doesn't seem to have any active powers in the books.) So while the depiction of the Hive was not accurate to the manga nor very frightening, it was at least interesting. The events at the Dreaming Spring with the Kin are a bit condensed and the companions learn a secret about Doom a bit earlier than in the books, but it still retains its impact. On to face Dread Mountain! After watching the anime for this series... I love it so much. Deltora Quest is absolutely amazing, and the manga does a great job of illustrating Lief's journey as he adventures to restore the belt of Deltora. I'm not entirely sure I'm ready to have my heart ripped out again by the conclusion however! Emily Rodda Makoto Niwano - Emily Rodda (real name Jennifer Rowe) was born in Sydney, Australia and graduated from the University of Sydney in 1973 with an MA (Hons) in English Literature. Moving into a publishing career, first as a book editor, and finally as a publisher at Angus & Robertson, Rodda's first book was published in 1984.